Expedia has announced the roll-out of a new “bid for placement” system for its hotel listings that was quietly tested through December and is now seeing limited use on their hotel bookings. This new Expedia Accelerator feature will be of interest to any lodging business participating in or considering participation in the Online Travel Agency (OTA). In this article, I will explore both what is known about and the speculation that surrounds Accelerator and what it may mean for B&B inns, boutique hotels, dude & guest ranches and other distinctive lodging providers. 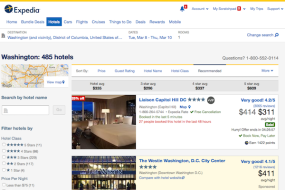 Expedia Accelerator allows hotels to bid for listing position. Expedia has not released a whole lot of information about Accelerator, but has gone on record as saying that participating hotels are able to bid on various top result slots to increase rank position on their location(s). A spokesperson for Expedia has stated that the bidding system is compensation-based, meaning a cost-per-sale, rather than a cost-per-click for a listing view. It also give hoteliers the ability to turn Accelerator on and off throughout the day, so that they can optimize their campaign based on the average highest volume of sales during the day. Another obvious reason for this transition is that it creates a new source of revenue for Expedia. Just like Cost-Per-Click (CPC) and other advertising, Expedia Accelerator creates another way for hotels to put more money into gaining visibility in the search results at the OTA. Criticisms about this move have been swift, sometimes vehement and, often, cogent. Also at issue is the fact that, so far, there’s been no clear identification of these paid listing positions, unlike those of CPC programs such as AdWords. Technology, travel and news journalist Phil Butler likens Expedia Accelerator to a carnival act, where the OTA is touting their new bidding system as a way to get ahead, but the real aim is to eat into the already slim profit margins of the lodging industry. If this new system is a success for Expedia is a success then you can expect that its reach will grow, first to a wider scope among hotels, including boutique operations, and then outward to other lodging types, including the Bed & Breakfast market. This will add another level of marketing consideration for innkeepers. If bookings via Expedia start to fall and/or your local competitors are making gains in placement via Accelerator then it will become important to look at ways to either fill the revenue gap elsewhere or test the program to see if it offers an acceptable level of profit by participating – don’t forget to consider your time, as well as your costs, for participation. B&B innkeepers, boutique hoteliers, and dude ranches who are either on, or are considering a listing, with Expedia are welcome to leave their comments. When Expedia acquired our PMS (Rezovation Web) and Bedandbreakfast.com, our OTA bookings at a hefty 20% increased, leading us to suspect that Expedia has commandeered and capitalized on databases of both companies acquired. Our GDS/OTA participation is managed THROUGH our membership in RezoWeb and B&B.com, rather than directly contracted with the various OTAs. We are a small, luxury B&B operation ( 9 rooms/cottages). Our subscriptions to these two subsidiaries of Expedia costs thousands annually. Then on top of that cost, the 20% reduces our income further. Now you suggest we may have to consider another layer of expense in order to compete! This is simply another case of the big corporation forcing small business to close. The motivation being greed. Wal-Mart versus the local variety stores, plain and simple.